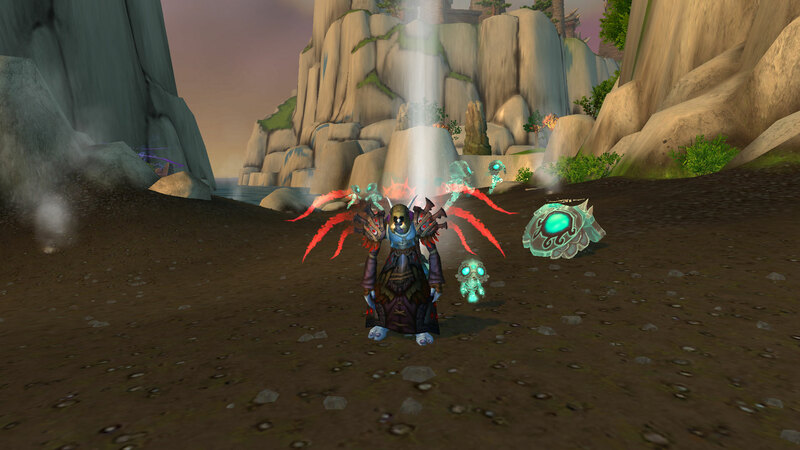 I always grind Epoch Stones off the Jademist Dancers on the coast of the Timeless Isle. Today, on my 228th kill, one dropped the Jademist Dancer pet! I wasn’t grinding for that purpose, but I’m excited that I got the little guy! A group of my friends have started playing WoW together casually on Friday nights. They invited me to join. It’s been years since I’d done anything group content like that – dungeons and the like. It’s a different feeling to play as a group while leveling compared to endgame where the goal is to plow through content for valor points. They had already started, so I decided to catch up. They play Alliance, and I’ve never spent much time on that side of the game. I was looking forward to seeing the Alliance story. 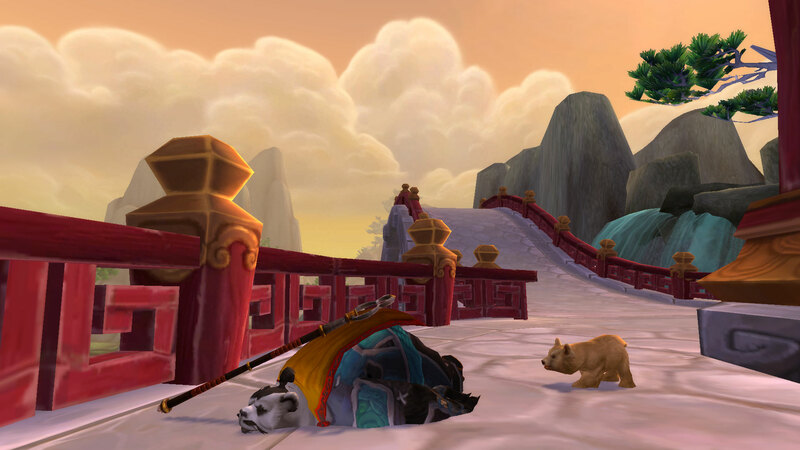 I decided to roll a pandaren monk. His name is Sleepypaw. You can see him sleeping with his bear cub watching him. The starting experience on the Wandering Isle was pretty fun, but nothing too amazing really. I enjoyed it, but the worgen starting experience was so much better. 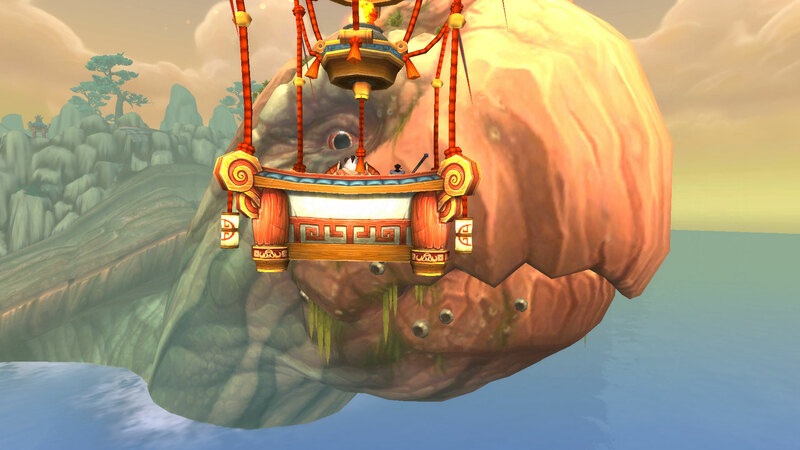 I did like getting the chance to talk to Shen-zin Su, the turtle known as the Wandering Isle. I also particularly liked Ji Firepaw, a Huojin follower, Aysa Cloudsinger, a Tushui follower, and their relationship. It was interesting to see them get close and then see that relationship strained. Of course, I chose to follow Aysa into the Alliance. After fighting Varian at his request, I became a full member of the Alliance! 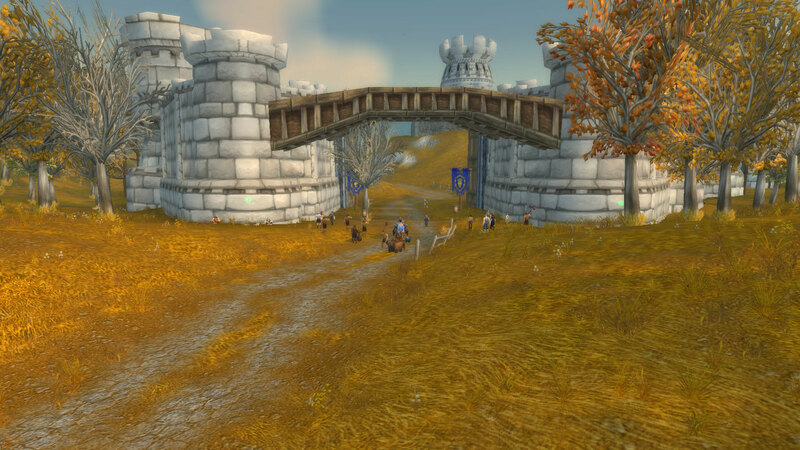 Stormwind itself is a beautiful city, and I enjoyed running around it. While Orgrimmar and Thunder Bluff have natural beauty, and I do particularly like the view of Orgrimmar from above mostly because I think of it as my city, Stormwind and Ironforge have a really heroic and powerful feel. I spent a couple hours one evening just running around Stormwind. I ignored the map so I could try to learn the city, looking around and using Stormwind Keep as a point of reference. After questing through Elwynn Forest, I headed into Westfall, which had a really interesting story. It did a good job of showing me how different the Alliance is. First, I helped a detective who was looking for clues to solve a murder. He even had little alarmbots circling the crime scene. I can’t imagine the Horde taking such a modern approach to murder. Yet on the other hand, I can’t fathom the idea of homeless members of the Horde – orcs unable to afford to live in Orgrimmar, starving and begging for food. 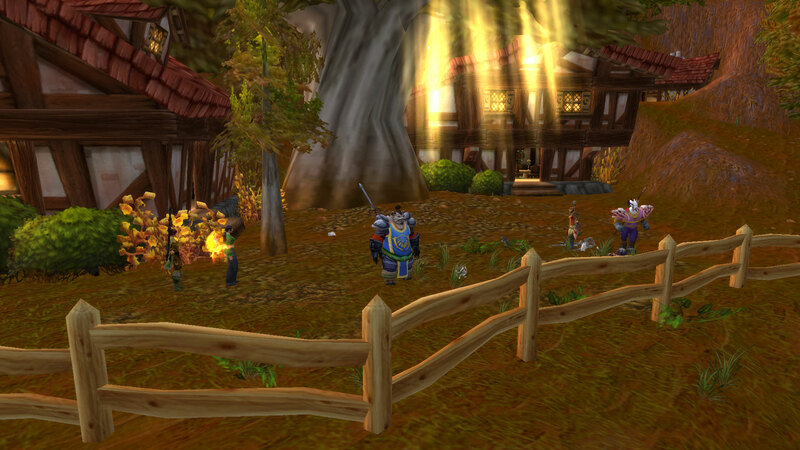 That’s what we see in Westfall though. Well, homeless humans, not orcs. 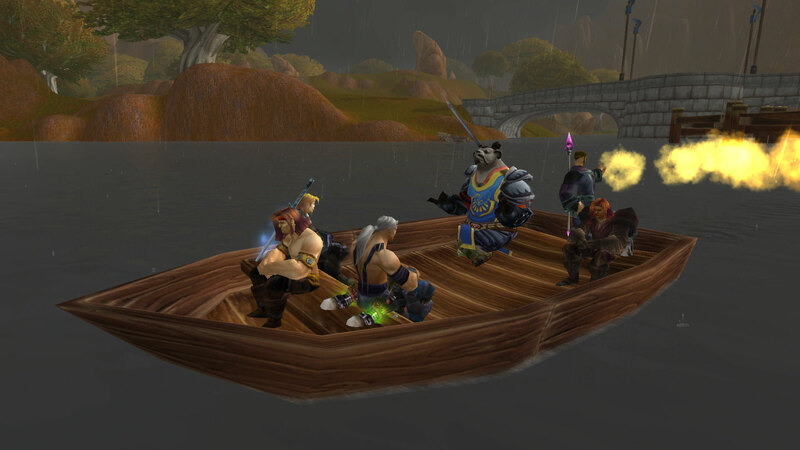 We learn that while the Alliance spent time and money winning the war in Northrend, they neglected things at home. Guards are posted to keep them out of cities, with signs warning transients to stay out of the area. This is probably one of my favorite screenshots now. It wasn’t a rare angle or anything like that, but it was a powerful moment in the story. After Westfall, I moved into the Redridge Mountains, where I joined Bravo Company and defended Lakeshire against Blackrock orcs. The most important thing that happened was meeting this girl who loves rabbits. I love rabbits too! The zone was quite idyllic when there wasn’t killing or war. Here’s a nice screenshot. I suppose the skeleton undermines my position on the zone though. The Bravo Company storyline was fun mostly because they tag along with you and say funny things. There’s a paladin who complains about the Light, saying that one day he feels like all his abilities are weaker. 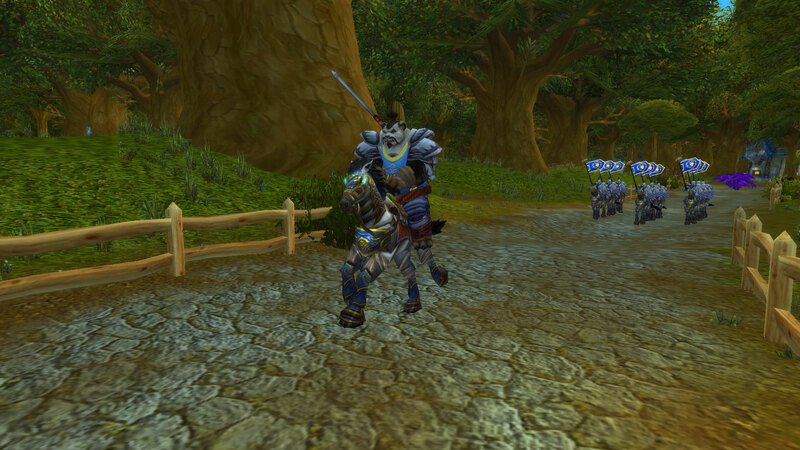 I’ve now made it to Duskwood and am level 30. I have full heirlooms for all three spec, so if my friends need me to tank or heal, I’ll have the gear for it (even if I don’t know how to play those specs). They might be a little higher than 30 now, but I think I’ve matched them approximately! I’ve had a lot of fun experiencing the Alliance side of things and am looking forward to more.